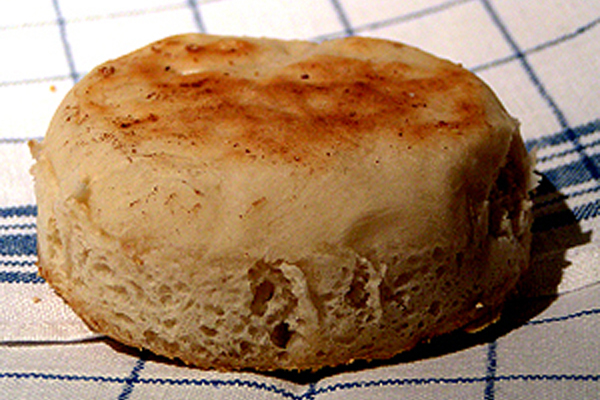 I especially love English Muffins for breakfast dripping with butter and jam. Read my notes below and never cut an English Muffin with a knife – fork split only. Of course these are better fresh and homemade but English muffins are available frozen at The English Shop in Söderhallen in Stockholm. They also have shops in Örebro, Uppsala, Malmö and Göteborg. 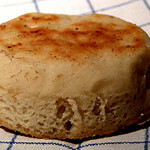 This recipe takes a bit of time but its the best one I have found for real English Muffins. Nice and yeasty, they toast up crispy and delicious. Break up the yeast in a small bowl to dissolve with the 2tbls. of warm water. While that is going, scold the milk in a small sauce pan by bringing it up to a boil and immediately removing it from the heat. Then with a fork or spoon remove the scum that will have formed on the top. Let this cool. In a bowl large enough to hold all the finished dough, place the water, sugar and salt give it a stir and then add the scolded milk. Be careful it is not too hot or it will kill the yeast. No warmer than 40°C (105°F) degrees. Now add the dissolved yeast and stir a bit. Add half of the flour and with a wooden spoon mix it all together well, it will be sloppy and wet like a batter instead of a dough. Set it aside to proof for 1 and 1/2 hours covered with a clean towel in a warm place. It will double in size and should collapse back on itself. To the raised dough now add the 45gr (3tbls.) of softened butter and beat in well. I usually do with 4 fingers of one hand, beating well to incorporate the butter. When the butter is well incorporated add the remaining flour and with your wooden spoon beat it in well. The dough will still be rather wet and difficult to handle because it likes to stick to everything. Flour your work surface well and turn the dough out on to it and knead it for a couple of minutes add just enough flour so that you can reasonably handle it. With a floured rolling pin, roll the dough out to a thickness just short of 1cm. or (1/2 inch) Then with a ring cutter cut out circles of 7 1/2cm. (3 inches) and place on a lightly oiled cookie sheet sprinkled with a generous amount of cornmeal to stop the dough from sticking to the tray. (Course ground polenta will do the job just fine). Gather up all the unused dough and roll it out again then cut out more disks, do this until all the dough is used up. The traditional way of forming the muffins is with metal rings 7 1/2cm (3inches) in diameter. Take a small piece of the dough and press it into the ring not filling it more than half way up. Set these on the cookie sheet and let rise as directed below. They are then cooked in the rings, which will come away from the muffin as it cooks, making it easy to remove the rings when done. Cover the cooking sheet now with a clean towel and set in a warm place for its second raising. Depending how warm your kitchen is, it should take about a half hour. When the dough has risen take a large cast iron frying pan, the type you would use for pancakes and heat it until it is hot but not quite smoking. Then lightly butter it using a paper towel to remove any excess butter. Gently lift each muffin up with a metal spatula and place them in the pan and cook on one side for about 4-5 minutes then turn them and cook of there top side for another 3-4 minutes. You can tell when they are cooked by their weight. They become rather light, split one and look inside to be sure. Remove to a cooling rack and repeat the process until all the muffins are cooked. These are best eaten right away or at least within the first few hours. If you’re not going to use them immediately throw them into a plastic bag and freeze them for later use. You don't need to spend any money on buying fancy metal rings. You can collect them, tuna or small pineapple cans are the perfect size for these. Remove the bottoms and you have them.